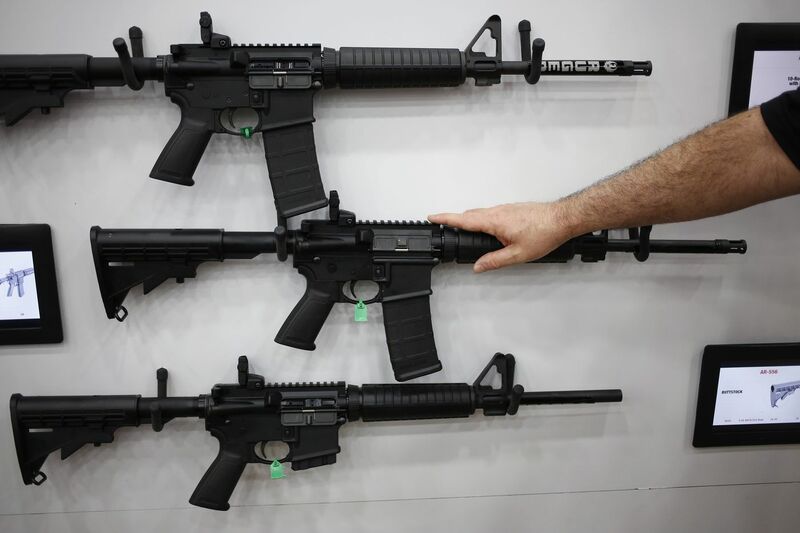 AR-15 rifles and their cousins are among the nation’s most popular and profitable weapons. The AR-15 fires one bullet with each pull of the trigger – thus, semiautomatic – but it is easily modified to shoot continuously until the trigger is released. In addition to sparking a national conversation about political rhetoric as a motivator for violence, anti-Semitism, and hate, the mass shooting at the Tree of Life synagogue in Pittsburgh last Saturday renewed debate about gun policy. Pennsylvania gubernatorial candidates: Democrat Gov. Tom Wolf, left, and Republican Scott Wagner. >> Read the full endorsement of the Editorial Board in this race here. Dean David (R): "We agree on something like bump stocks, that banning something that takes a semiautomatic weapon and makes it essentially automatic makes sense/ … If we're all agreeing that there's got to be better communication between mental health and law enforcement, let's pass that bill. If we're all agreeing that high-capacity magazines are something that we can compromise on, let's do that. But let's not pack 50 things in a bill and say 'Well, I tried,' because you know what? You didn't try." Pennsylvania Fifth Congressional District candidates: Chrissy Houlahan and Greg McCauley. Second Congressional District candidates: Seth Grossman and Jeff Van Drew. Seth Grossman (R): "When it comes to gun control we have a paradox. It seems that most of the gun deaths or mass shootings seem to occur in gun-free zones. So I think we've got to move away from the idea that fewer legal guns means less violence and less killings. … I cannot picture how another federal law would make anyone safer." Jeff Van Drew (D): "I absolutely support universal background checks. … In fact, I believe that we should have a better, more thorough, better-run universal background-checks system. … I also believe that universal background checks should be truly universal. Nationally, whenever there is a transfer of guns, there is no reason that somebody should have a gun without a quick [check], and they made it quick now, you can really get a federal universal background check very quickly, gun shows, and so forth. I think that that's a good thing to do." Tom MacArthur (R): "I am a supporter of the Second Amendment. I've been a strong supporter of Second Amendment rights. But at the same time, I'm a father, I'm a grandfather. I don't know anyone that wants people running around with guns that are a danger to themselves and others. I have advocated for universal background checks. … I have advocated for and supported increased funding, grants for school to harden the environment. … I don't believe in arming teachers." Andy Kim (D): "I think it is ridiculous that we haven't been able to get into place the universal background checks, the closing the gun-show loophole, the private online sales. These are all steps that should have been done a long, long time ago, and the fact that we haven't even been able to do that after the Las Vegas massacre and the Parkland shooting is disgusting to me. "